From left to right, Coun. Paul Carr, Hydro One Ombudsman Fiona Crean and MPP Todd Smith. Photo by Buckley Smith, QNet News. 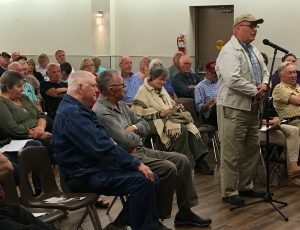 THURLOW – People in Thurlow voiced their frustration with Hydro One at a standing-room only town hall meeting Wednesday night at the Gerry Masterson Township of Thurlow Community Centre. The meeting was organized by Thurlow Coun. Paul Carr because of public outrage over hydro rates. 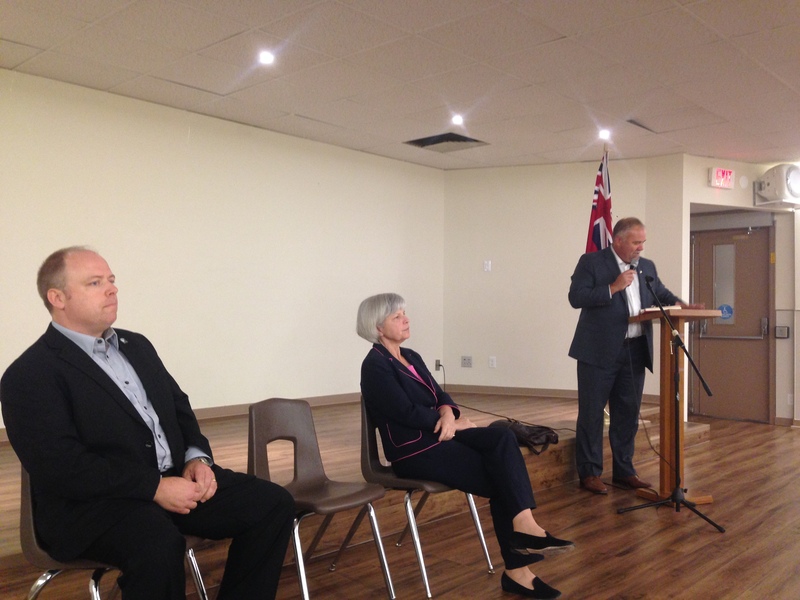 MPP Todd Smith and Hydro One Ombudsman Fiona Crean were in attendance. Residents brought up several issues including: the formatting of their bills, recently installed Smart meters, delivery charges that are higher than usage charges, fluctuating rates, customer service and even how Hydro One employees are using their company vehicles. Another Hydro One customer Julie Gowthorpe said when she called customer service about the amounts she had been billed that she said she was told she was right to be upset, but it couldn’t be fixed. “They agreed that the bills were outrageous, but there was nothing they could do about it,” she said. Coun. Paul Carr agreed that this situation cannot continue the way. MPP Todd Smith agreed with Carr and said he is just as frustrated as everyone else. 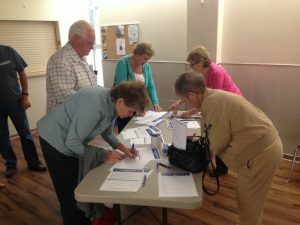 Citizens at the Thurlow town meeting sign a petition to change how hydro costs are regulated. Photo by Buckley Smith. Ombudsman Fiona Crean said she is aware of how frustrated people are. “I have been open since March and I’m at about 1,500 complaints and rising,” she said. But despite the amount of complaints coming through her office and at the meeting, Crean said she does not have the power to fix these issues on an individual basis. Many of the residents in attendance said they had called Hydro One to complain, but were met with rude and unhelpful customer service agents. More than a few people even said they were given different answers to the same questions depending on who they talked to in the customer service department. While Crean attempted to reassure those in attendance that this will be fixed, it wasn’t enough for everyone. Gowthorpe, who is a psychotherapist in Belleville, said this issue is even beginning to take a toll on people’s mental health. “I can tell you that over the last year one of the highest stressors people have, when I ask them what is going on, is hydro bills,” said Gowthorpe. Bob Johnson, a resident of Thurlow, voices his displeasure with Hydro One. Photo by Justin Medve. Many residents said they thought that conserving how much energy they used would be the easy fix. Hydro One has even begun sending customers a breakdown showing how much power residents use compared to others in their area as a way to encourage conservation. But residents who follow the tips provided by Hydro One say that their bills still remain extremely high. Crean says the rates were raised because the company has to keep in line with revenue projections given to its board of directors. Crean says she has heard this complaint many times, and understands how it makes no sense. “There is a bizzareness of being charged more when you’ve used less,” said Crean. As the night went on, and the residents continued to voice a variety of complaints with the company, it started to become clear that fixing Hydro One does not come down to one or two issues. And while Crean says she hopes to have Hydro One turned around as a company within a year, people at the meeting said it may be too late to fix the damage to its public reputation. One Thurlow resident, Bob Johnson, who worked in the energy industry for 35 years even, went so far to say that he is now ashamed to have worked in that field.